This conference will be built on a platform of shared dialogue, where the aesthetics of musical minimalism are seen to engage with other contemporary art forms, interrogate and assimilate other musical styles and traditions, and adapt to the stage and screen. Contributions are welcomed in the form of individual papers (20 minutes), themed sessions of 3-4 papers, lecture-recitals (30 minutes), and workshops. Please include your name and institutional affiliation, if any. For themed sessions, please submit all abstracts together with a brief description of your session’s theme. For lecture-recitals and workshops, please contact the organizing committee at MinSoc2019@cardiff.ac.uk before submitting your proposal to discuss your plans informally. Registration is now open for the Sixth International Conference on Music and Minimalism, June 21–25, 2017 in Knoxville, TN. The registration fee includes participation in the conference, coffee and other refreshments, a conference program, and administrative and logistical support. Registration also includes admission to all afternoon and evening concerts (including 5 evening concerts featuring the music of Julius Eastman, Mary Jane Leach, Marc Mellits, Ellen Fullman, Randy Gibson, Moondog, Brooks Frederickson, Carolyn Chen, and more). Please see the Nief-Norf website for the registration form and further details. You are warmly invited to attend the Fifth Annual RMA Music and/as Process Conference at the University of Wolverhampton’s Performance Hub in Walsall on Saturday 20 May 2017. 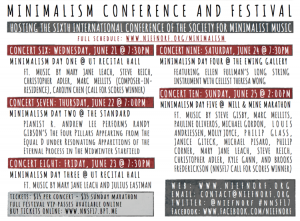 This year’s conference is in association with the Society for Minimalist Music. This one-day conference is themed around patterns, with presentations covering a range of subjects from Hip-hop as musical process to old and new minimalisms, and from sight-reading pattern recognition to compositional structures as dramaturgical tools. Jennie Gottschalk, author of the recent Bloomsbury book Experimental Music since 1970, will give the keynote, and Paul Cassidy will give a solo performance of Steve Reich’s Piano Phase in the evening concert. A detailed programme for the day can be found here. There will be an informal meal at the Metro Inn by the Walsall Campus following the conference. Information for the UoW Walsall campus can be found here. Please note that there is also an X51 (express) bus service which runs by the Walsall campus from Birmingham city centre. The recommended accommodation for the conference is the Metro Inn, within a few minutes’ walk of the campus. There is more accommodation in central Walsall (a 30-min walk from campus, or a short bus/taxi ride away): Premier Inn, Lyndon House Hotel, The Park Inn by Radisson is slightly closer to campus, further along the ring road. With the support of CCHIP: Centre for Creativity, History and Identity in Performance and the Faculty of Arts at the University of Wolverhampton. The keynote speaker for the conference will be Jennie Gottschalk, author of the recently acclaimed Bloomsbury publication Experimental Music since 1970. An evening concert given by Paul Cassidy will include a solo performance of Steve Reich’s Piano Phase for two pianos. The theme of the conference is Patterns. Whilst the Music and/as Process Study Group has previously been aimed towards the field of music, the call remains open to other disciplines within the arts and beyond who are drawn towards an association with the theme. The deadline for proposals is March 20, 2017. For the complete call for presentations see here. The UK premiere of The Juniper Tree an opera by Philip Glass and Robert Moran is to be staged in London by The Helen Astrid Singing Academy in an innovative production which brings together professional musicians and singers with a community choir and children, as part of Richmond-upon-Thames’ Music and Drama Festival in March 2017, in what will be Philip Glass’ 80th year. Press release here. The Juniper Tree is a “macabre tale with an unexpectedly happy ending”, according to producer Helen Astrid. It is based on what has been described as “the grimmest of the Brothers Grimm fairy tales” – a story of how a young boy is killed by his wicked step-mother and fed to his unwitting father in a stew but later comes back to life. The opera was composed by Glass and Moran, with a libretto by award-winning Arthur Yorinks, in 1985 and is one of the few operas by Glass in the English language! The Helen Astrid Singing Academy has been invited by the Music and Drama Festival 20117, Richmond-upon-Thames, to perform an extract from The Juniper Tree as the headline act at the Festival launch on Sunday 12th March 2017, 2.00pm at the Harlequins Stoop, Langhorn Drive, Twickenham, Middlesex, TW2 7SXT. 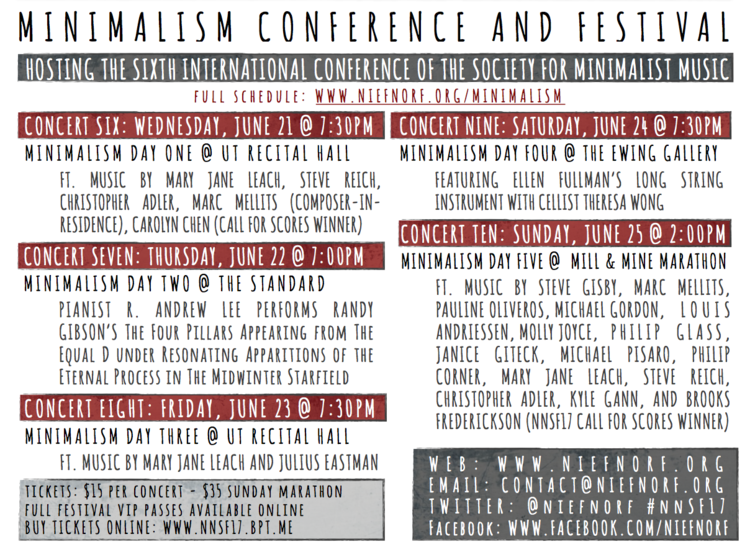 You are kindly invited to submit proposals for the Sixth International Conference on Music and Minimalism, hosted by the University of Tennessee and the nief-norf Summer Festival in Knoxville, TN. Performances and discussions will feature the music of Maryanne Amacher, Julius Eastman, Ellen Fullman, Randy Gibson, Michael Gordon, Mary Jane Leach, Marc Mellits, Steve Reich, Anna Thorvaldsdottir, arrangements of Moondog’s music, and much more. All scholars and practitioners are invited to submit proposals on music and minimalism. Maryanne Amacher, Laurie Anderson, Louis Andriessen, John Adams, Harold Budd, David Borden, Glenn Branca, Gavin Bryars, Tony Conrad, Rhys Chatham, Rick Cox, William Duckworth, Julius Eastman, Brian Eno, Paul Epstein, Jim Fox, Ellen Fullman, Kyle Gann, Peter Garland, Karel Goeyvaerts, Michael Gordon, Jon Gibson, Philip Glass, Louis Hardin (Moondog), Christopher Hobbs, Eva-Maria Houben, Terry Jennings, Tom Johnson, David Lang, Mary Jane Leach, Daniel Lentz, Annea Lockwood, Alvin Lucier, John Luther Adams, Jo Kondo, Ingram Marshall, Steve Martland, Meredith Monk, Nico Muhly, Max Neuhaus, Phil Niblock, Michael Nyman, Pauline Oliveros, Hans Otte, Charlemagne Palestine, Michael Pisaro, Larry Polansky, Eliane Radigue, Steve Reich, Terry Riley, David Rosenboom, Howard Skempton, Ann Southam, James Tenney, Anna Thorvaldsdottir, Kevin Volans, La Monte Young, and many others. Historical, cultural, analytical, philosophical, phenomenological, ecomusicological approaches; sound studies, disability studies, reception studies, queer studies, etc. Please note: Accepted papers will be considered for publication in a planned volume of conference proceedings. Please send abstracts (300 words) as PDF attachments to minimalism2017@niefnorf.org by January 15, 2017. In your submission, please include your name, institutional affiliation, and any audiovisual requirements. For themed sessions, please submit all abstracts together with an additional abstract describing your session theme (100 words). For lecture recitals, please include links to any supplementary audio or video materials. Please email any questions or concerns to minimalism2017@niefnorf.org. Watch highlights from the 2014 Research Summit: rehearsals of Steve Reich’s Drumming with Russell Hartenberger. Cost: The fee for the conference (including all performances) will be £50. Students, Adjuncts and the Unwaged will pay £25. Both fees include refreshments and all performances. An optional conference dinner will be arranged; this will be payable separately. Proposal deadline 29 June 2016. See MLAM FINAL CFP 11 May 2016-2 for complete CFP. A few things to keep in mind before you do so. be sure to have your credit card and other relevant details at hand before you begin the registration process as this might “time out” if you take too long to complete the forms. you may use the following cards when registering: Visa, Visa Electron, MasterCard, Maestro, Diners Club and JCB. Note that American Express is not accepted. Delegates with a Finnish bank account can pay directly using the Finnish online banking system (verkkopankit). if your credit card is not accepted, or if it is not possible for you to pay in one of the above ways, we would advise you to contact the conference secretary (minimalism@utu.fi) to inquire about us sending you an international invoice for the registration fee. note that the registration form will send you automatic confirmation of registration even before payment has been made. Do remember, though, that this will not be considered formal registration (and therefore you will not be entitled to participate in the conference) unless we have evidence on our files that a transaction has taken place. You should receive a receipt for your records once the payment process is complete. be sure to complete all of the relevant sections of the form by correctly ticking the boxes that apply to you (minimalist music society member, non-member, and so on). be sure also to tick the box for the conference dinner on Thursday in Turku if you will be attending. note that student bursaries are still available from the Society for Minimalist Music for those of your who are not salaried staff members at a university and otherwise do not have the financial means to attend the conference. We recently updated the conference website with details about travel and accommodation, among other things. Further updates are forthcoming. Please read these pages carefully for advice on these matters. Several delegates have asked about the best time to arrive and leave the conference. Our advice is to arrive in time for registration and the welcoming get together and concert on Wednesday evening, and to leave following the conclusion of the conference on Sunday at 12.30, allowing an hour for travel to the airport. Delegates attending the meeting of the Society for Minimalist Music will need to stick around until 2.30 pm. Note that Wednesday and Thursday nights (23, 24) will be spent in Turku, and you should make your hotel reservations accordingly (taking advantage of the special rates at our list of recommended hotels if you wish). Friday and Saturday nights (25, 26) will be spent in Helsinki and you should make arrangements to stay in Helsinki on those nights. You can naturally do as you wish, but the easiest option for many of you might be to book a return flight to Helsinki and travel onwards to Turku from there with a single (one-way) ticket, either by train, bus or air. Further details can be found on the conference website. We will be organising bus transportation between the two conference sites (in Turku and Helsinki) on Friday evening and this is included in the registration fee. Look out for updates about keynote presentations and presenters, the conference programme and the like. Keep in mind that a final version of the programme will only be available once registration is concluded early in September, although we should be able to sketch in times for sessions, keynotes, concerts, the conference dinner and other things quite soon. Welcome, once again, to Turku and Helsinki. We’ll send additional updates in the weeks ahead. If you have any inquiries, please contact the conference secretary in the first instance (minimalism@utu.fi). The lack of a bursary would make it impossible for you to attend the conference. These bursaries will be awarded on a case-by-case basis by the Society’s Committee, and preference will be given to members who have not received bursaries in the past. Applications should be sent to Kay Potter at kay.potter@hotmail.co.uk by 31st July.